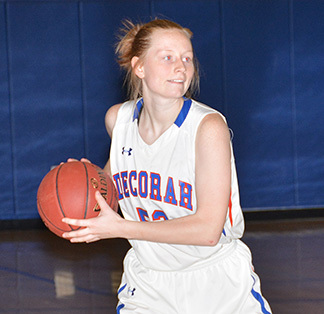 As the 2018-19 season winds down the Decorah girls’ basketball team (3-17, 2-9 NEIC) split the conference games earlier this week. Monday night, the Lady Vikes managed to finally face off with Oelwein (7-12, 3-8 NEIC) on the court, pulling off the come-from-behind win, 41-35, at home. Neither squad had a solid first eight minutes as Decorah held a 6-2 advantage before the Huskies sent the Vikes scrambling on offense to maintain a slim 15-14 halftime lead. Oelwein came on strong in the third quarter, to go ahead 24-19. Decorah put up 21 points in the fourth to get the win. Nia Whitsitt posted 13 points, while Ambria Pipho added nine. Abigail Milburn had six in the win. Contributing four points each were Amanda Kuehner and Emma Nierengarten. Decorah had Class 3A No. 9 Waukon (15-3, 9-3 NEIC) on the edge Tuesday night in the first half before wearing down to be defeated, 60-35, at home. The Vikings and Indians put up a combined 28 points in the first quarter, with Decorah trailing 15-13. Waukon pushed its advantage to six in the second to go into the locker room ahead, 29-23. In the second half, the home team faltered under the Indian pressure, held to 12 points in the final 16 minutes. Pipho led the team with eight points. Amanda Kuehner was close behind with seven, while Milburn and Whitsitt collected six each. Also on the board with four points apiece were Nierengarten and Skyler Malone. Decorah will be at Charles City Friday, Feb. 8, at 7:30 p.m. for its final regular season contest. The Vikings then turn their attention to the postseason, which begins with Independence in the Class 4A Region 3 quarterfinal Wednesday, Feb. 13, at 7 p.m. in Independence.